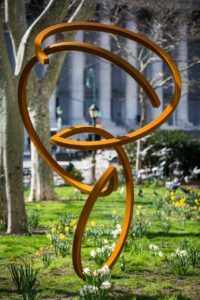 Made of corten steel, the twelve-foot-tall sculpture was engineered in 2015 by New York’s Knippers Helbig Advanced Engineering. 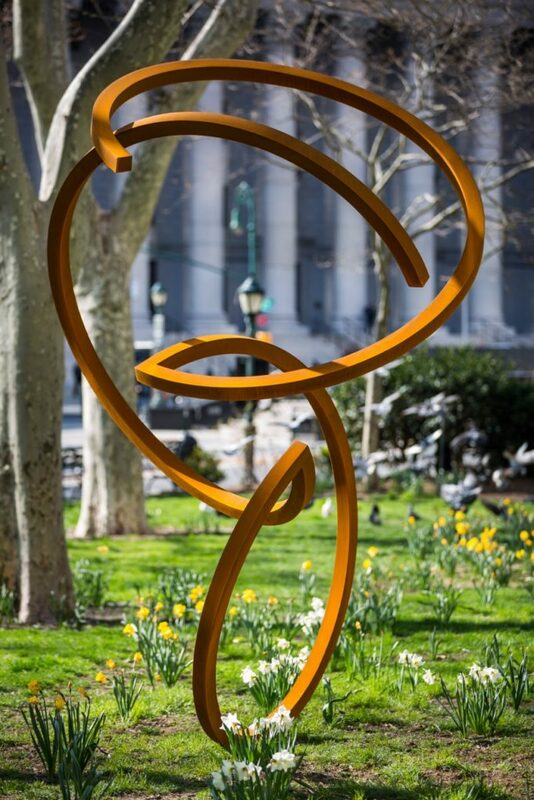 It was previously installed in Foley Square at Thomas Paine Park in Lower Manhattan. Explored through a palette of materials traditionally used in the building industry, the ideas informing my work are based in mathematics, architecture, and experience. I am particularly interested in geometry, symmetry, and rhythm—line, plane, and volume—as well as visual perception and spatial understanding. Much of my work has grown out of a specific obsession with chirality or “handedness.” Three-dimensional chiral objects do not have an internal plane of symmetry. While they can be mirrored in three dimensions, the left and right cannot be superimposed. Chirality is a characteristic common in many areas of chemistry and biology. It describes, for example, the left-and-right parts of the human body, like hands. Using very simple geometric forms–circles, rectangles–I apply this more complex operation of symmetry and create the components and compositions of my work. 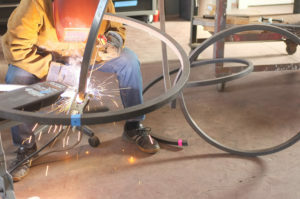 This particular sculpture, Three Rings 6′ Diameter, is made of three chiral ring components–one right and two lefts, an arbitrary distinction. 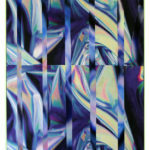 The results of this work are unexpected rhythmic spaces that contain limitless perceptual contradictions: three-dimensional patterns that are at once familiar and foreign, heavy forms that imply weightlessness, delightful spatial experiences that extend threatening invitations, seduction tempered with caution. And all the while line teasing out plane, plane carving out volume–whether actual, implied, or perceived. Dee Briggs was born in 1968 in Burgettstown, Pennsylvania. 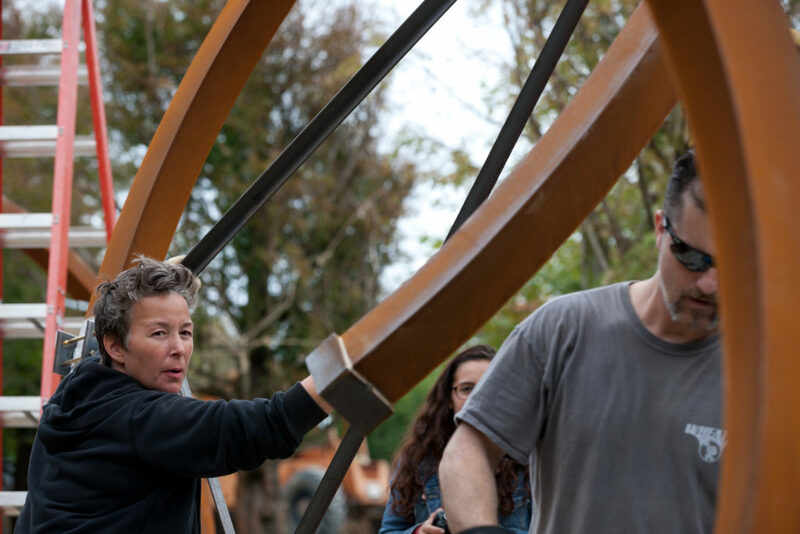 She received a Masters of Architecture degree from Yale University in 2002 with undergraduate studies in architecture at the City College of New York. 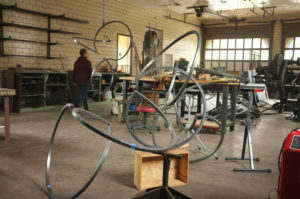 Briggs exhibits nationally and has taught in the schools of art and architecture at Carnegie Mellon University. She lives and works in Pittsburgh.